We’ve all seen it in our own workplace—whether it’s a department meeting that receives little or no response, employees who make a beeline from their desk to the break room and back, or managers who can’t name everyone on a team. Lack of engagement isn’t always limited to such visibly obvious symptoms, but scratch the surface, and it’s often there. A Gallup study shows that up to 68 percent of employees are not engaged in the workplace. Yikes! The effects of disengagement are not just limited to sighs, yawns, and the parking lot emptying at 5:01 p.m. sharp. There’s a major impact on the bottom line—the same Gallup study estimates that lost productivity as a result of disengaged workers cost U.S. companies $450-$550 billion dollars per year. To put that number in perspective, that’s more than double Apple’s annual revenue. Yes, you read that correctly—we’re flushing the annual sales of Apple down the drain, twice, because companies often fail to engage their most important audience—their own employees! 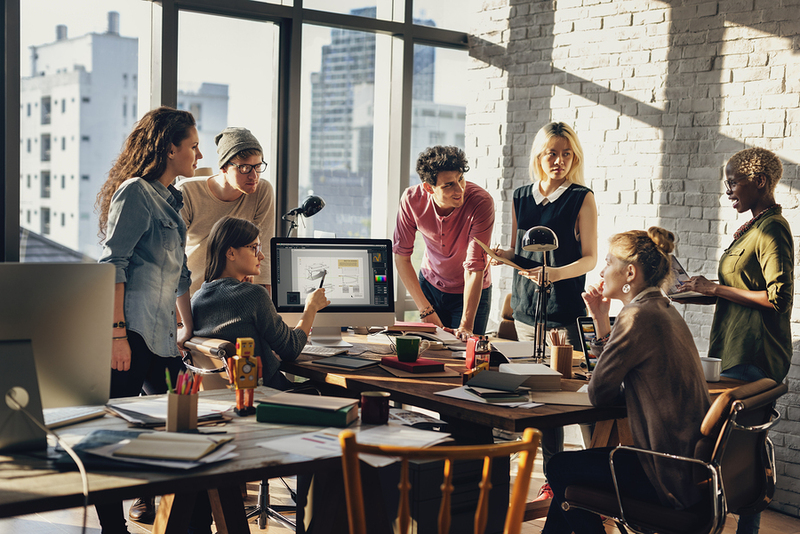 So, why is employee engagement and a healthy organizational culture essential when it comes to attracting top talent and fueling innovation today? Harvard Business School emeritus faculty James L. Haskett writes in The Culture Cycle that “effective culture can account for 20-30 percent of the differential in corporate performance when compared with ‘culturally unremarkable’ competitors.” Just as disengaged workers drag down performance and create costly turnover, engaged, culturally-fit employees create additional value—they’re 27 percent less likely to turnover, and the best cultural fits begin generating profit 15 percent faster than their counterparts. So the answer is simple, right? Engage employees through a healthy organizational culture—and voila, you’ll be wiping the floor with your competitors. Unfortunately, it’s not so easy. Creating a deep and lasting connection amongst staff doesn’t come from ping pong tables, kegerators, and company picnics alone! There are usually much deeper foundational needs to address in order to create a unique culture. Let’s take a look at a more strategic blueprint for building a transformative and intentional employee experience. We’ll go over the key points you’ll need to address, and give examples of strategic goals—and ideas for achieving these goals—in each section. Does your team struggle with conflict or accountability? How about core values? It’s pretty common to jump past underlying organizational needs such as clarity around core values, or a team-wide dysfunction like a fear of conflict. It’s hard! But it’s even harder for people to have fun or care about togetherness if the basics aren’t in place like trust, accountability, commitment, and so on. Have a trusted employee or third-party facilitator gather a group of stakeholders and employees that are representative of the company. Ask the group to collaboratively tell the story of the company (or an amount of time leading up to the present)—focusing on important highs and lows that affected the team. While listening and asking questions that dig deeper, identify and note words (from feelings and emotions to terms that resonate) from each mountain (high point) and valley (low point). After reaching the present, take a break, then reconvene to discuss what words were highlighted, allowing the team to identify the ones that resonate most with them. While the final language may need to be tweaked, these are core values extracted from your unique team and story. By including members of the team in this process, they may be more likely to utilize core values as a filter for decision making. You can find a more in-depth guide to the Mountains and Valleys core values exercise via Culture Sync. Idea: Read “The Five Dysfunctions of a Team”—together! Addressing dysfunction is a major challenge, which is why companies and teams hesitate to do it. Teams that are willing to address common causes of dysfunction are able to better align around common objectives, make higher quality decisions, and retain star employees. Lencioni crafted this book as a “business fable,” making it easy to read and digest in a matter of hours. It also includes a team assessment, which allows individuals to self-assess their contribution to dysfunction, creating awareness of current roadblocks and behavioral solutions. Easier said than done, right? This is where the fun can actually start, though—with listening! Practicing empathy and listening to the team is a habit that will provide value for years to come. Take the time to deeply understand what people care about and believe in. Sometimes you even need to give people those cathartic, get-the-old-gunk-out-of-the-system moments to help them see that the business is committed to a meaningful employee experience. An employee listening tour can often be coupled with a baseline activity like an employee Net Promoter Score (eNPs) survey that will help you tell if your culture is growing and improving over time. Once you have a culture baseline and understanding of what your team desires, set some realistic and attainable goals such as increasing internal communication, giving accolades when core values are demonstrated, and even something as simple as stopping to celebrate wins. OK, you put in the time to understand what’s important to your team and have some context for the type of culture you’d like to create. Idea: Monthly lunch dates with conversation prompts for team members. Goal: Strengthen creativity as a muscle. Idea: Weekly creative breaks with activities for the entire team to do together. Idea: Foster vulnerability with a team-wide “greatest gifts” feedback conversation. But the best part—the truly best part—is when you design these things alongside your team and not behind a curtain. Invite others into the process with brainstorming sessions and team lunches to craft a meaningful employee experience together. True culture adoption begins in the planning stages once you’ve empathized with the team. They will feel heard, valued, and invested in. Isn’t that what you were looking for in the first place? Dan is the Client Service Director for SmallBox, a creative agency in Indianapolis that is passionate about meaningful employee and brand experiences and educating creative teams. His expertise runs the gamut from providing strategic consulting and facilitation for enterprise level and non profit organizations, to managing advertising and marketing for national musicians.